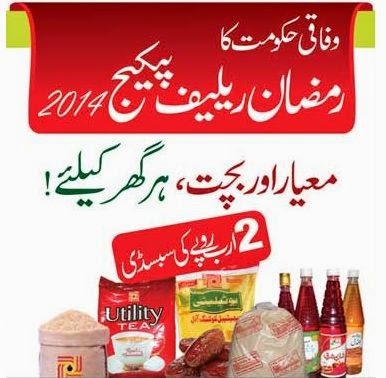 Federal government has announced subsidy of 2 Billion Rupees under Ramazan Relief Package-2014. Under this package over 1500 items will be provided on a chain of Utility Stores on discounted rates. Utility Stores already offer discounted rates on common grocery and kitchen items but government offers special subsidy to give relief to the public in the holy month of Ramadan. Price of Utility Ghee is Rs.130 per kg, Utility Oil 142 per liter, Khajoor 160, Basin 70 and Rice 90~92. Discount of Rs. is offered on 20kg flour bag. 5 to 10% special discount is offered on other 1500 items.